N MUSIC I MAY BE CONSIDERED conservative, but I am neither conservative nor am I a traditionalist, I am just rooted to the origin. For me tradition is not going to the past, but going to the origins. This is the great limitation of so many traditionalists: they refuse modernity and they pretend to live still in the past. After reading the beautiful book about history and memory from Jacques Le Goff, a great French historian, I have come to think that all these classifications – past, present, future, modern, ancient and so on – are mainly constructions of our mind that may help us to make sense of what surrounds us, but sometimes can also mislead us. One of my books about liturgy is called La Presenza, “The Presence.” In the liturgy we are living at the Present of the great absent. We cannot see Him but He is there under the Eucharistic species, in His own word proclaimed during the Mass, in the person of the Priest and also in the midst of us (“When two or three…”). Liturgical music is the sign of this Presence; it is not an emblem of the present. Usually the harmonic and musical techniques of music performed from “contemporary groups” are far less advanced than many of the compositions of “conservative” musicians. So conservative is more modern than contemporary. But the idea is that some people, many I think, are confused between modernity and mass society. 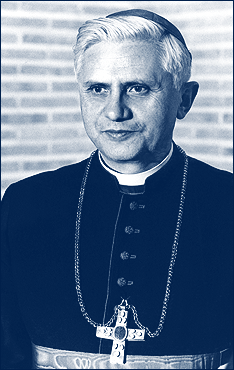 So we are modern or contemporary (even if the two words do not mean the same thing in an historical context), when we adhere to the culture that surrounds us, but that culture, as was identified well by Cardinal Joseph Ratzinger in his book The Spirit of the Liturgy, is not the outcome of people’s aspirations and social interactions, but a huge marketing operation. DOES IT MEAN ALL IS BAD in our society? Of course not. We live in a time of unprecedented advancement and opportunities. This has given us something: the internet, a revolution in the way we communicate. And this is the problem with some traditionalists that are not attached to church tradition but to the past. I remember years ago I had an acquaintance with a priest belonging to one of these congregations that celebrate Mass in the Extraordinary Form. I introduced him to one of my friends who told me, with good reasons, that this priest looked as if he was coming from the XIX century; in the way he curled his hair, the glasses, even the umbrella: everything made him look like a post card from one century ago. Of course there are also people that are not like this, they just like Extraordinary Form because they think it is a better way for them to participate at the Mass. After what I have said before, of course I can understand them. Having said that, I need to recognize that I cannot blame the works of liturgists and theologians that try to understand the impact of modernity on ourselves, without confining themselves in a comfortable and fake past. The Tridentine Mass is not the past, it is the expression of eternity and so can be the Mass of Paul VI, if correctly celebrated, without selling it every Sunday on earth to the knights of capitalism.